Stories of the last bank in town are grabbing headlines. But new FCA research shows that the picture on the ground is more nuanced. Banks have been shrinking their branch networks rapidly. Between 1988 and 2012, the number of bank branches halved and the rate of closures is on the increase. This trend naturally gives rise to concerns about access to financial services – with the Treasury Committee recently opening a consultation on the issue. Meanwhile, consumer groups warn about the loss of access to key services, especially in rural areas, while banks are keen to point out that more and more people are using digital banking as a substitute. Despite all this attention, we know relatively little about the impact of branch closures on consumers. While there is some research on aggregate closure patterns across the country, to date there has been no analysis of the circumstances and banking habits of those affected. To better understand the picture on the ground, the FCA combined its own branch network data from 2012 to 2017 with detailed individual-level data on the banking habits of a representative sample of consumers from 2015 to 2017. These data tell us precisely (i) where branches are located at different points in time, (ii) which consumers are local to each branch and (iii) which consumers are affected by the closure of a local branch. This article presents three key insights from our research. In 2012, the UK had an average of 20.3 branches per 100k inhabitants. Five years later, this had decreased to 14.7, a drop of 27%. Although closures were not spread evenly across the country, all regions of the UK were affected (Northern Ireland had the highest closure rate at 37%, Wales the lowest at 22%). Due to closures, consumers are having to travel further to access bank branches. The FCA used OpenStreetMap's algorithms to calculate the travel distance from a consumer’s house to the nearest branch of their bank. In 2015, the average consumer had to travel 2.5 miles to their nearest branch (4.8 for those living in rural areas, 1.8 in urban areas). By 2017, this had increased to 2.6 miles (5.1 in rural areas, 1.9 in urban areas). The FCA also analysed the proportion of consumers affected by closures. It found that between 2015 and 2017, 9.1% of consumers in rural areas had to travel at least an extra mile to their nearest branch due to closures, compared to 6.8% of consumers in urban areas. This increase in distance is not necessarily problematic for all consumers. But for vulnerable consumers, such as disabled people or the elderly, who may have difficulties travelling, the decrease in local branch access can present significant challenges. We found that older consumers (those over 60) were more likely to be affected by a local branch closure. Next, we looked at the local level. We found that branch coverage varies widely across local authorities. Table 1 shows the 10 local authorities with the lowest coverage of bank branches as of late 2017. To put these numbers into context: the lowest coverage (in Broadland) is three times lower than the UK average for 2017. The rate of change can also differ greatly: whereas a small proportion (2%) of local authorities saw no reduction in per capita branches, the local authority with the greatest decline – Lisburn and Castlereagh – had 55% fewer branches per capita in 2017 than in 2012. Our research also identified several areas where a significant proportion of the population ended up living at least 10 miles away from their nearest branch in 2017. 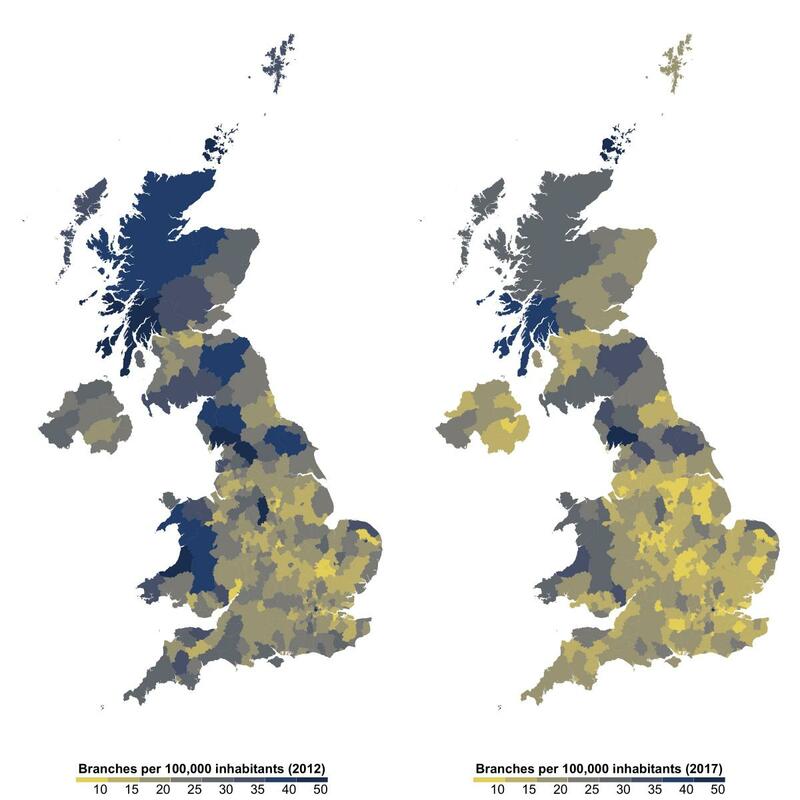 This includes West Devon, with 45% of people living at least 10 miles away, Aberdeenshire, with 41%, and Newry Mourne and Down and Richmondshire, both with 38%. We also looked at the socio-economic characteristics of local authorities affected by closures. Branch coverage declined more in local authorities that are more deprived (based on the 2015 Indices of Multiple Deprivation for England) and have lower median incomes. However, this does not necessarily mean that banks are simply pulling out of poorer areas. 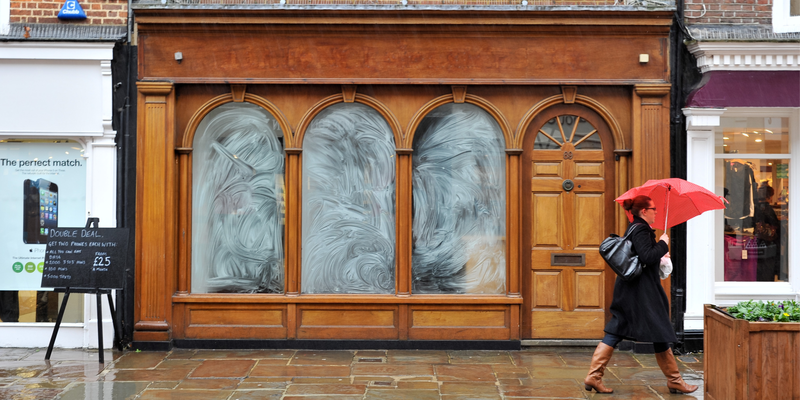 Most branch closures have occurred in urban areas, which on average have higher rates of deprivation, but also smaller proportions of heavy branch users (such as cash-based small businesses, older and non-digital consumers). Even though rural consumers are more likely to be affected by closures, we found that banks are less likely to close branches in local authorities that are more rural. Although these findings seem paradoxical, they are explained by differences in population density. Since the next nearest branch will be further away in rural than in urban areas, the proportion of consumers affected in rural areas is higher. So how do people cope with a branch closure? We compared the behaviour of consumers affected by a branch closure with similar consumers that did not see a closure. This approach allows us to disentangle the ‘closure effect’ from the general trends of increasing digital banking use and declining branch visits. Our data tell us very clearly that a significant proportion turn to mobile banking. An average branch closure leads to a permanent 7% increase in the adoption of mobile banking. However, we find that consumers over 60 years old do not increase their adoption of mobile banking at all, which may have implications for their access to financial services. We also find that a branch closure leads to an increase in branch visits before closure, then a permanent decrease in visits across all branches of the same bank (i.e. including alternative branches to the one that closed) afterwards. This trend could be attributed to a rise in digital banking, as well as consumers opting to use services like the Post Office in lieu of their local branch. What do closures mean for consumers? Despite differences in bank branch coverage at the local level, most UK regions have seen similar rates of branch closures, according to our 2012-2017 data. However, closures occur more frequently in urban areas, where there is more likely to be another branch nearby if the local one closes. Although we find that potentially vulnerable consumers are not more likely to see their local branch close than other consumers, the impact on these types consumers could still be substantial. Elderly consumers, for example, do not seem to take up digital banking after their local branch closes. Because they may struggle to travel the extra distance to an alternative branch, a branch closure for these consumers may really ‘bite’. This article is based on research by Jeroen Nieboer and Claudia-Robles Garcia. Jeroen Nieboer is a Technical Specialist at the FCA and Visiting Fellow at the London School of Economics. Claudia-Robles Garcia is a research analyst at the FCA and PhD candidate at the London School of Economics. From the pre-crisis period to the present day, proprietary FCA data paint a picture of a market in flux. John Adams once claimed finance did more harm than good. Peter Andrews argues this was a little uncharitable.